Deciding where to live in Ecuador can be a daunting yet exciting prospect. Though the country is only the size of Nevada, the choices in lifestyle are many. You’ll need to decide if you’re a beach bum, mountain lover, or maybe even a jungle dweller. Do you want to reside in a large metropolis, a small city, or a quaint village? Those are all important things to factor in to your decision and ones that only you can answer. But another consideration for many expats is what to do with their time once they choose a place to live. If you’re interested in Ecuador’s northern Andes, rest assured that expats are enjoying a wide variety of activities to keep themselves occupied and fulfilled. Here are a few of the most popular choices. Get some exercise. There may not be any 24-hour fitness centers with Olympic-size swimming pools or on-site tennis pros, but there are plenty of options for staying active. With the mountainous surroundings in Imbabura Province you can find hiking trails at every level. If you’d like to trek straight up the slopes of an extinct volcano you can do that. If you’re looking for a mostly flat stroll through countryside roads, that’s available too. There is even a hiking group or two among expats already on the ground so this also gives you a chance to meet new people as you hike. In addition, there are salsa classes, yoga, Zumba, and even a group of regular pickle-ball players in Cotacachi. Even if you’re not up for a heavy workout, just walking through the streets of Cotacachi, Otavalo, or Ibarra is a good way of being active during the day. Relax and recharge in local thermal springs. Though there are no active volcanoes nearby, being on the “Ring of Fire” has the added benefit of easy access to hot springs. A 45-minute drive from Ibarra will take you to Chachimbiro Hot Springs near the small town of Urcuqui. For less than $5 you can soak all day in hot mineral-filled waters while surrounded by the peaks of the upper Andes. If you don’t mind spending a little more you can take advantage of the spa portion of the complex where you can enjoy mud baths, massages, saunas, and more. Don’t forget to ask for the half-price senior discount if you’re age 65 or older. There are restaurants just outside the boundaries of the hot springs area and even stores that sell swimming equipment and sunblock. There are also a few small cabins nearby if you want to spend the night in this tucked away haven. Explore. Most tourists never get off the main highways and roads so they miss some of the best that the area has to offer. One of the benefits of living in the area is that you’ll have time to explore those out-of-the way areas. Ecuador’s Andean corridor is home to many craft towns and villages and the northern segment is rich with old country workmanship. The small town of San Antonio de Ibarra is where you’ll find talented wood carvers who are just the last in a long line of generations to learn the skill. You can browse through galleries of fine wooden creations all produced by hand. Or ask to see the workshop where you can actually observe the magic taking place before your eyes. Near Lago San Pablo you’ll find artisans creating woven baskets and mats made from reeds that grow in the lake. In the town of Peguche there is a co-op of weavers who use non-mechanical looms. Wherever you go you’ll find that each town is nuanced and has its own flair. From fresh produce to Alpaca blankets, browsing the market in Otavalo is a great way to spend your day. Shop ‘til you drop. I’m not talking about hitting the chain stores in a shopping mall, though Ibarra has a nice new modern mall of its own. Instead, enjoy the rich experiences of visiting family-owned stores, chatting with local fruit vendors, and furnishing your home with native art. Many expats report that their favorite weekly activity is going to the produce markets where you can fill giant shopping bags to the top with fresh food for under $10. The sights and sounds are a feast for the senses and the buying process is a great way to practice your Spanish. 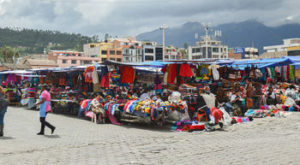 Otavalo has the continent’s largest indigenous market on Saturdays and you’ll find all manner of great products to buy. From Alpaca sweaters to hammocks for your porch and nearly everything in between the merchandise is there and at great prices. Socialize. What fun is living abroad if you can’t share the experience with others? Cotacachi has a healthy expat population. 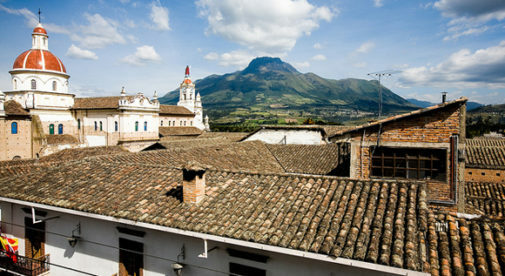 Otavalo and Ibarra also have their share of expats. There are plenty of great restaurants and cafés where you can catch up with friends or join one of the expat activity groups. If you befriend Ecuadoreans you will have a constant stream of invitations to weddings, birthdays, christenings, and community festivals.